The frame "Subsoil" contains a table with the list of values of the parameters of Winkler-Pasternak subsoil C1 and C2 or deformation parameters of soils (Edef, ny, hz), respectively, depending on the setting in the frame "Settings". 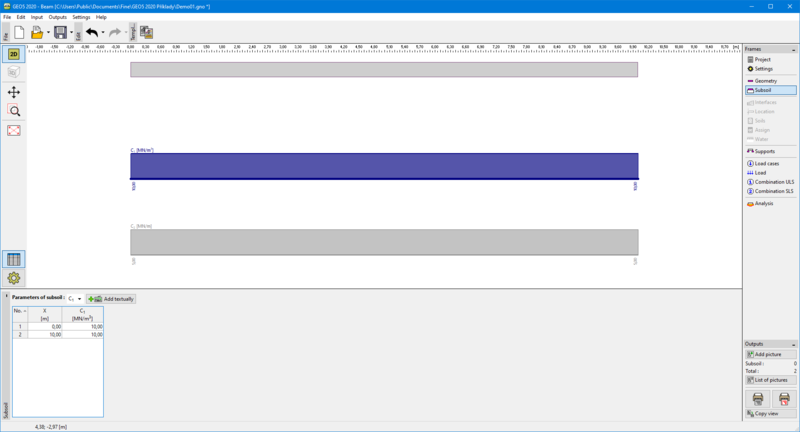 Adding parameters is performed in the "New parameters of subsoil" dialog window. The table shows values of the parameter that is selected from the combo list above the table. Adding (editing) points is performed in the "New subsoil parameters" dialog window. The window serves to specify the X -coordinate and the value of the parameter.